The Grand Central opened on the 3rd of April 1922 for James Donald's circuit of cinemas, and was a conversion of Allan's Stores at 286 George Street, in the northeast of the city centre. The seating capacity of 730 was contained in a modest single storey building, with a small balcony in the largely unadorned auditorium. Pilasters on the sidewalls supported fake ceiling beams to provide the only real decorative touches, with crimson seats, cork linoleum and carpets underneath. 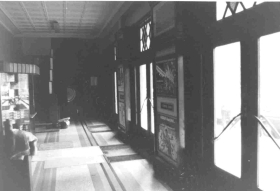 The foyer was entered through three sets of double doors, with a central pay box inside, to either side of which were stalls and balcony entrances. 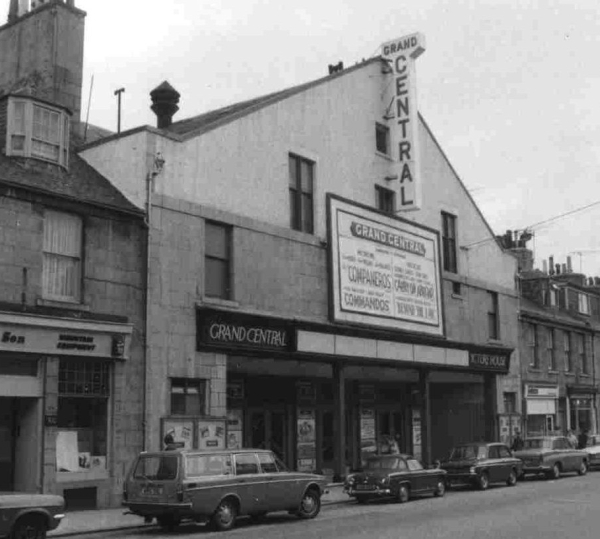 Opening the cinema was the main feature, "Over the Hill", with a full supporting programme. Kiosk Having been built in the silent era, a 4-piece orchestra provided musical accompaniment, initially under the direction of Harold Pollard. Later musical directors included Burton Denham, J.M. Taylor, Marjorie Littlejohn (under whom the orchestra swelled to 7 members in 1926), F.J. Archer and Jack Robinson. Within only a few years of opening, owner James Donald had acquired adjacent properties with a view to expansion, but plans drawn up in 1927 by architect George Watt were postponed, and his enlarged, but still plain, wood-panelled scheme was never implemented. He does, however appear to have had a hand in the actual expansion, which eventually happened in the last few months of 1929. Complete closure proved only to be necessary for 6 weeks between November 16th and December 29th. What re-opened on December 30th was a completely different cinema - the original stone facade was now capped by a large, triangular upper storey, with a harled finish. The centre of this new facade sported a good-sized advertising board, with three large windows behind and to either side of it. Above this, a vertical name sign ran down the central axis of the triangular profile, covering a single, smaller window higher up the facade. The canopy over the main doors now proclaimed the building to be the "Grand Central Picture House Super Cinema". ceiling illuminated the space. The grand reopening was attended by the Lord Provost, who viewed "The Three Rings" as the main feature during an evening that also saw a performance by a Welsh Miners Quartet. Only a few months later, in April 1930, the Grand Central was wired for sound, and presented Bulldog Drummond as the first talkie. Interestingly, it had earlier screened a silent version of The Jazz Singer, with live singing by one Jack MacLachlan - billed as the Scottish Al Jolson - making up for the absence of a recorded soundtrack! By the mid-50s, the Grand Central witnessed yet another refurbishment, this time to accommodate a Cinemascope screen. By now, most of the atmospheric elements had gone, painted over or removed. The stage area and orchestra platform were replaced by a new, simpler proscenium, built further into the stalls, but some elements of the original proscenium were said to survive behind these alterations. The new screen was framed by a red rectangular proscenium arch, adorned with gold stars, behind which a new screen-end wall was built without decoration, bar vertical pink and beige stripes. 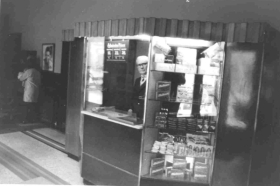 The closure of the City cinema in 1963 saw that cinemas Simplex projectors replace the Grand Central's Kalee machinery, and in around 1973, the entrance to the cinema was tidied up, and the canopy altered so that it now simply read "Grand Central Picture House". 1977 also saw the addition of a new illuminated sign. By this time, the auditorium was a shadow of its 1929 rebuild, with only the coffered ceiling and the plaster garlands on the balcony front giving any idea of former glories. Closure finally came at the same time as James Donald's Queen's cinema, on October 17th 1981, and with them both, the last vestiges of his main cinema exhibition business. The building itself survived until 1984, when it was swept away for a housing development.